Hui Malama Ola Na ‘Oiwi ‘Generational Connections’ event scheduled « Ka'u Rural Health Community Association, Inc.
Hui Mālama Ola Nā `Ōiwi invites you to our 2nd Annual E Ola Kākou: Generational Connections event funded by Susan G. Komen. 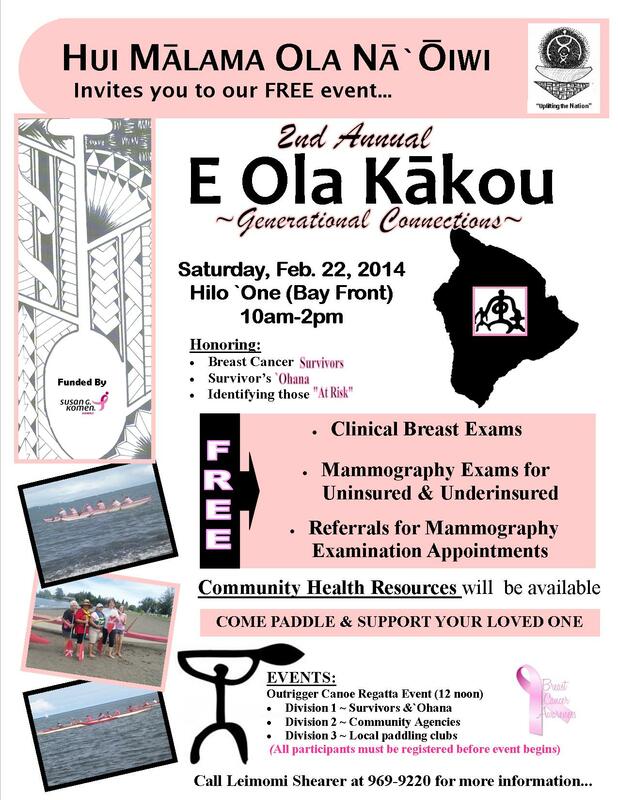 This event is will be held on Saturday, February 22, 2014 from 10am-2pm in Hilo at Bay Front to honor Cancer Survivors, Survivors `Ohana & for those who may be at risk for Cancer. I have attached a flyer which gives more detailed information. There will be FREE Clinical Breast Exams & Mammography referrals/services on location along with some valuable community health resources information. What a time to get in the water to participate in the canoe races! Put a team together with your co-workers and enter a friendly competition in support of our Cancer Survivors, Survivors `Ohana & for those who may be at risk for Cancer. PLEASE pass on this flyer & email throughout your agency and to your ohana & friends. We hope to see you there to have fun on this special day! If you have any questions, please contact Leimomi Shearer at 969-9220 or leimomi@huimalamahawaii.com.